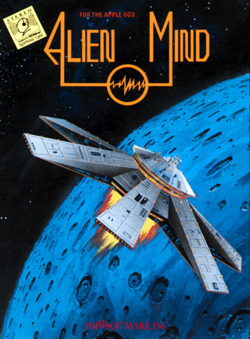 Alien Mind is a top down shooter released exclusively for the Apple IIGS on December 31, 1988. It was progammed by Rob Karr, with art created by Matt Crysdale. Biologist and physicist Timothy Hunter is about to take part in research at the Zekford Space Station Laboratory with an old friend, Aaron Avery. Aaron arrives at the station first and sends Timothy a telegram containing news that two alien eggs have been found nearby, with one of them showing signs of hatching. Timothy arrives at the station; where everyone is dead and receives a message from Aaron, informing Timothy about what happened and how the menace can be stopped. It's up to you to control Timothy and help defeat the highly intelligent life form that has taken control of the station... before the second egg hatches. This page was last edited on 12 November 2009, at 01:54.